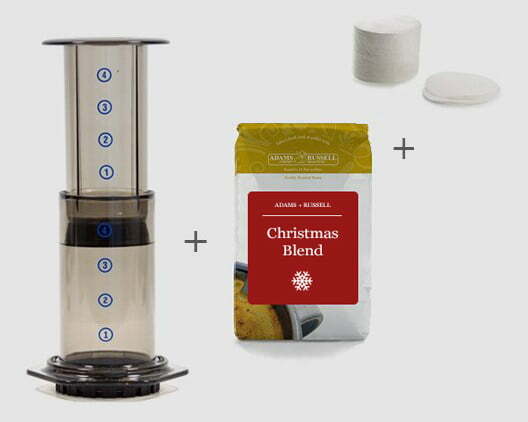 The Aeropress gift set is the perfect present for a coffee lover who appreciates freshness and convenience. In this set you will receive the classic Aerobie Aeropress coffee maker, 350 high quality paper filters and a bag of our freshly roasted Christmas blend coffee. Our experts at the roasters have hand selected these products to go into this special gift set. They wanted to provide convenience and premium quality for customers, so gift giving can be simple and delicious this year! Once a year we release our Christmas Blend Coffee for customers to enjoy exclusively over the festive period. A blend 100% arabica beans which consist of 50% Java and 50% Ethiopia come together to create a magical combination of high quality flavours. These beans are dealt with delicately and carefully to maintain the irresistible aromas and flavours. That is why we roast the two origins separately, 50% high roast and 50% medium roast. Our roasting experts developed this technique to achieve the best taste possible and to achieve an even roast every time. These beans produce a cup that is rich, full bodied and showcases flavours of dark chocolate and a floral finish. It is a truly unique blend that is a must try for any coffee lover. The acidity is low which creates an easy to drink cup which is certainly moreish. We have paired the Aeropress with our Christmas blend as it creates a wonderfully smooth cup that any coffee connoisseur would appreciate. The Aeropress is favoured for it’s smooth and clean tasting results, which works perfectly when used with the Christmas blend. The device gained its popularity after many people around the world discovered its convenience, ease of use and fast brewing. Although Christmas is often described as the most magical time of the year, for most it is often the most hectic time of the year! Our coffee experts get customer feedback and brainstorm the best ideas for creating special and convenient gift sets that make a big impact. Take a look at our full range of Christmas Gift Sets here. Or, if you need some inspiration, take a look at our Christmas Gift Guide.